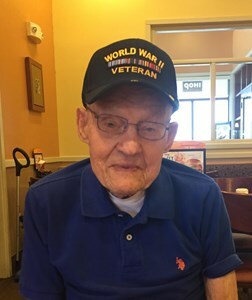 Steven Frank Mittura, 100, of Junction City, Kansas, formerly of Allentown, PA, passed away on Wednesday, March 13, 2019 at his home in Junction City, KS. Cremation has taken place. In lieu of flowers, memorial donations are suggested to be given to the organization of the donor's choice. Services in Pennsylvania: A memorial funeral mass will be held at 10 AM on Saturday, March 30, 2019 in St. Paul's R.C. Church in Allentown, 920 S. 2nd Street, Allentown, PA. A visitation will be held from 9 AM until the time of the service, all in the church. Inurnment with military honors will follow at Woodlawn Memorial Park, Allentown. Arrangements entrusted to K.V. Knopp Funeral Home, Inc. He was born on August 5, 1918, Johnstown, Pennsylvania to John and Mary (Molchany) Mittura. Steven retired from the United States Army as a Sergeant First Class. He served from August 24, 1936 until March 16, 1963. He was a World War II Veteran. Steven also worked and retired from the Fuller Company in Catasaqua, PA. He owned and operated a painting business painting many homes in the Lehigh Valley area. On August 7, 1943, he married Mildred Cannon at Fort Eustis, Virginia. Steven is survived by his daughters, Joan Lipsky of Junction City, KS, Carol Kozakiewicz and her husband Richard of Macungie, PA, Iris Dolgos and her husband Joseph of Allentown, PA; sister, Eleanor Herman of Jacksonville, NC; six grandchildren; six great-grandchildren and many other extended family members. He was preceded in death by his parents, his wife Mildred and fifteen brothers and sisters. Mass-Hinitt Funeral Chapel, of Junction City, KS, has been entrusted with cremation arrangements. Add your memories to the guest book of Steven Mittura.